....this is not intended as an exhaustive listing of exhibitions I have participated in. The first exhibition in which I was a participant was a joint exhibition at Roen Art Gallery (a small local suburban gallery) with school friend artist Heather Robinson in June 1981. My paintings were only exhibited once more in the eighties, in 1985. My works were rejected by all the commercial Melbourne galleries I approached in that decade. 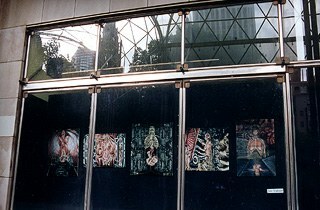 I then exhibited with the Contemporary Art Society of Victoria from 1992 to 1996. 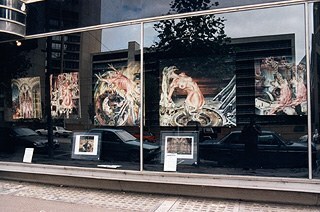 Since 1995 I have exhibited with Roar Studios, an artist run gallery. My first solo was at Roar in June 1999. My works were also included in the Roar stand of the 1996 Australian Contemporary Art Fair 5 (the Australian Contemporary Art Fair is now known as the Melbourne Art Fair). 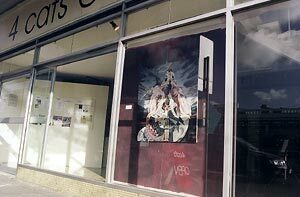 In the nineties, I did one better than the previous decade: I was rejected not only by all the commercial galleries I approached in Melbourne, but also all of the commercial galleries approached in Sydney. In Australia if it's not decor, Australiana, or the faux avant garde, it will not sell! .... when art is defined by the (art) market it is no longer art that is sold, but a commodity intended to pay for the wages, rent, overheads of the venture (gallery) in question. This means that the gallery is not going to exhibit anything that might conflict with the art orthodoxy of the day. When the 'artist' deliberately sets out to create work that caters to market appeal, for the sole purpose it being sold, instead of expressing an idea, they are reduced to the status of artisans, not artists. Regardless of whatever talent these artisans may possess they instead create objects d'art, not art. 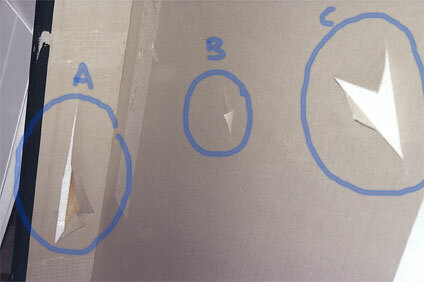 The creation of such pseudo-art usually entails a considerable degree of self-censorship. It is 'art' that has only come about by researching what buyers want. High art has nothing to do with with what buyers want, for the prospective buyer is merely looking for a work of craft that serves merely as an adjunct to their other decor. Art created with the tastes of the prospective buyer reduces the artist to an artisan whose work contributes nothing to the sum total of human endeavour. (featuring paintings from 1989 -1993). The city square was demolished shortly afterwards..... not, I am assured, because my paintings were exhibited there! 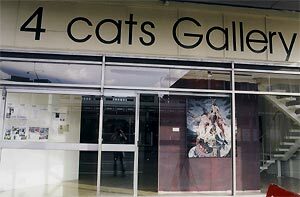 Amalgam - duo exhibition of the works of Lee-Anne Raymond and Demetrios Vakras at Melbourne Gallery 4Cats, 9 April to 27 April 2002. In October of 2002 four of my paintings will be travelling to Chicago, USA. In an exhibition organsied by Veronika Kotlajich of Echo Galley (Chicago) for Halloween, my works will be featured alongside those of other artists, including Daniel Ouellette. I suppose it should not be unexpected that my first exhibition outside Australia would be in Chicago. 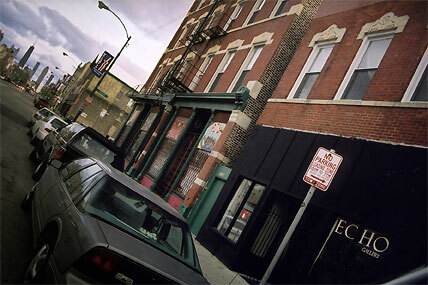 After all, the exhibition "Dada and Surrealism in Chicago Collections" held in Chicago in 1984-85, exhibited works from the private and public collections of that city. It was a profound demonstration of just how many superb surrealist works were collected in just this one city. "Chicago's interest in Dada, and especially Surrealism, is not a new one... Chicago's involvement with Dada and Surrealism is a phenomenon mainly of the 1950s that continues today. It was in the 1950s that saw the beginning of great collection of quality and depth that have had an impact on the role of modern art in the community and the direction that artists here have taken for nearly four decades. This exciting, formative period of activity coincides with the decline, if not rejection, of Surrealism by the New York art world...To arrive at an understanding of the growth of the extraordinary holdings in Chicago that constitute the exhibition...it is enlightening to look from this juncture around 1950 in both directions: to the waning of New York's interest in Surrealism, and to the rise of the Chicago art community." Echo Gallery directors, Derek (left) Veronika (right), with Demetrios and partner Lee-Anne (centre). In January 1999 I finally came on-line after overcoming my Luddite tendencies and purchasing my first computer. Since then more galleries have been approached, both domestically and in the US, via e-mail; regular mail; as well as in person but without success. Any assumption that the US somehow has a pluralistic art market is misplaced. From magazines like the moronic JUXTAPOZ; to the publisher Morpheus; to Arnie Fenner's fantasy kitsch publication, SPECTRUM; to Galleries like Forum, the only criterion considered in gauging what art is to be reviewed or exhibited is its popular/market/$$ appeal. FORUM is constrained by a conservatism that entails Odd Nerdrum's exquisitely painted but pointless decor is exhibited. Its "evocative feel" is good enough to convince any self-respecting decorator that with Nerdrum we have decor with intellectual/artistic gravitas. However, simple juxtapositions with foreboding skies and still-life-lit multiples of the same figure are not a corollary to a "deeper meaning"; nor does a Rembrandt-like execution add to its profundity. JUXTAPOZ only showcases art its readership can emulate. If the work is too technically accomplished it might alienate its readership*. We aren't all artists. But if you're a JUXTAPOZ reader then the purpose of that magazine is to help you cultivate your personal delusion that you are. It acts as an affirmation to all those aspiring to grandeur but who lack ability. * the last edition of JUXTAPOZ to feature an artist of note was the Spring 1998 edition (Volume 5 Number 1) which showcased the work of Judson Huss. SPECTRUM confuses fantasy kitsch as fantastic art and thus diminishes the credibility of genuine artists... When it comes to a comparison between Fuchs or Giger with Frank Frazetta kitsch, there is no comparison. For Spectrum however they are all practitioners of the Fantastic! Indeed it is publications like Spectrum which really increase the difficulty for genuine artists to be taken seriously. Once galleries come to associate Fantastic Art as being the kind of art(sic) Spectrum promotes as being "fantastic art" they lump genuine fantastic art with the comic book illustration that Spectrum promotes. When one is confronted with the misdefinition propounded and popularised by Spectrum it is easy to appreciate why James Cowan, head of Morpheus, refers to "fantastique" art instead of fantastic art.... Publications like Spectrum have commandeered the definition of a genre and diminished the artistic credibility of genuine practitioners. It may be a small irony, but one advertiser in Juxtapoz is an Australian "gallery": Outré. "Outré Gallery specializes in all sorts of unusual and weird art (originals and prints) - Retro/Pop, Underground/Alternative, Fantastique, Comic, Hot Rod, Dark/Macabre and beyond." Fuse from the inside. The camera's flash made it appear brighter. It isn't even a gallery proper, but a nightclub/pub with a small exhibition space. 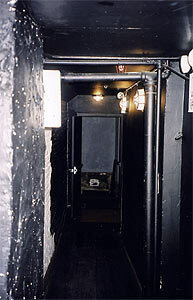 It is graffitied on the outside, and after going down a dark narrow corridor you reach a bar. The exhibition space is closed off. Although staff are inside they will ignore you. My conclusion: it is a dive! your chance to reverse that process"
Is this a New York thing? ...Despite what New York/New Yorkers think, the town is very conservative. The art scene is one that is a mixture of showcasing very safe pop-art culture of the kind Juxtapoz showcase (a consequence of not knowing enough about art) ... or the exhibiting of work by bona fide artists whose reputations have already been established in other countries... (a consequence of the pretentiousness of the art collecting elite, ie Forum). 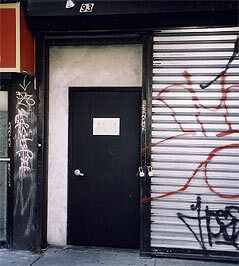 Another of the New York City disappointments is CFM Gallery. ... In Australia there is a dearth of art books of much interest. However, in the USA, and in New York City in particular, we (my partner & I) spent AUD$1000- on art books which we never knew existed. One of the purchases was at a gallery, CFM. If you go to CFM and see any book on Leonor Fini, DON'T BUY IT there, you'll be ripped off. After buying a book on Leonor Fini at CFM for USD$85- , we saw the identical book sold elsewhere for USD$55- !! When the exhibition at Echo finished my works had to return from the USA. Fortunately for Australians they are protected by a vigilant customs and quarantine department whose actions are governed by Australia's self-belief in Australia's innate and central importance in world affairs which they, the frontline troops, are to keep intact. Armed with the knowledge that events of global significance are more likely to happen on Australian soil than anywhere else on this planet their job is to protect Australians. In protecting this country from a world full of villains their vigilance is not tempered by their stupidity or lack of imagination. So it was, that when my purpose-built art crate reached its destination, Australia, the authorities of this country acting with the impunity possessed by a body which can act with complete immunity from the consequence of their actions decided that my crate posed a risk. Somehow, in the nation central to world civilisation, my crate with its paintings was, it seems, no more than a Trojan Horse intended to get in underneath their radar. So in looking for the means by which I was going to to corrupt the Australian mind these authorities decided that there must be something of value concealed in the crate and this of course excluded the paintings. The interior of this crate was slashed (below is one of the photos I have taken). Parts of the polystyrene were gouged out ... looking for heroin? What? The joins of this crate are glued and stapled together. These were pried apart by customs looking for the pestilence I may have intended to bring into the country. Alas, these vigilant defenders of the chastity of a nation alrerady f#=ç@*ked found nothing. So now, as a monument to Australia's vigilance, I have a crate which I can not use again. It is no longer dust/bug proof as anything can now get into it. Its interior is in a condition that if I repaired it by taping up their slashings to use it again to transport paintings it will appear that the crate has been tampered with which will thus elicit investigation again. It's not even good as fire-wood as its exterior is painted yellow and the polystyrene lining will give off toxic vapours. Thanks Australia! above: cricled, the superb craftmanship of Australian customs. This is only part of the damage by Australian customs.